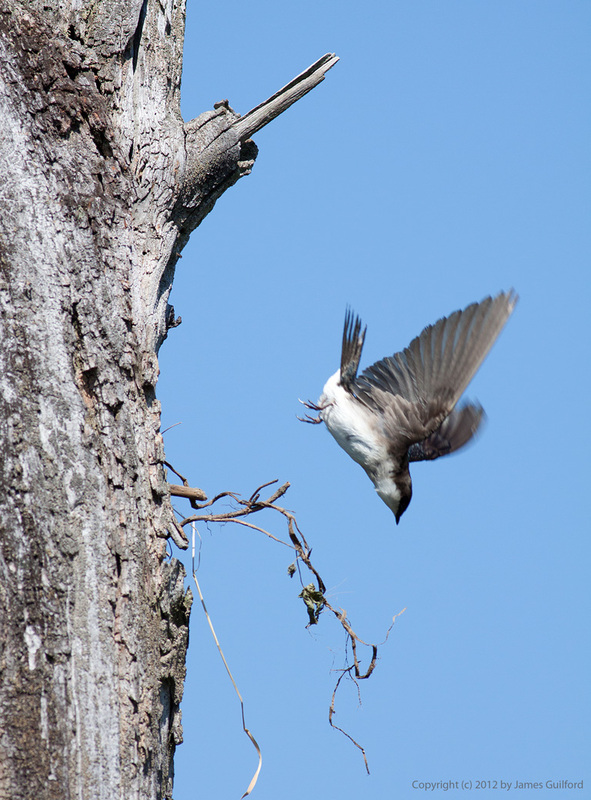 A female Tree Swallow launches herself from her nesting hole just under the broken branch. Vacation Day #5? Not really. I spent Friday doing things other than photography. The photo above was from my visit to the Cuyahoga Valley National Park’s Ira Road Trailhead/Beaver Marsh area. I watched as a pair of Tree Swallows (Tachycineta bicolor) made frequent commuter flights between nearby ground and areas of the surrounding wetland. I couldn’t be certain whether they were feeding young or working on their nest within the trunk of a dead tree. This was one occasion, however, when I wished I’d carried a tripod — the birds are fast and I’d have liked to catch them arriving at the nest hole or together but the narrow view of the telephoto allowed little lead time. Still, I’m very happy with this picture: the female diving from the nest hole beginning yet another flight. I hope you have some plans one day to publish a book with your photography. You are so good at writing about the pictures you post. But to grab this shot, just as the lady of the house was emerging from her tree? Fabulous!